I’ve had a Raspberry Pi sitting on my desk at home for months telling me whether I had new Gmail. At $35, the Pi is cheap, but I sure wasn’t getting my money’s worth using it as a glorified dock notification. 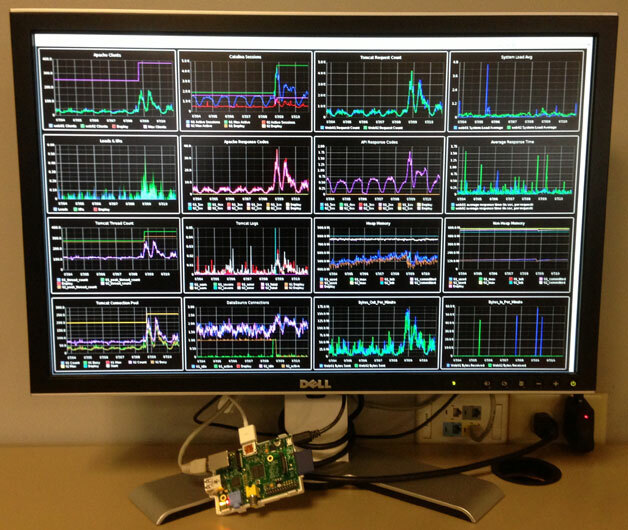 Then I saw this post from Pivotal Labs about using a Pi as a kiosk. I immediately thought of using a Pi to display Graphite graphs at work, and while it took an ashamedly long time to get moving on the project, the configuration only took an hour. Update 2015-02-25: As of the 2015-01-31 release of Raspbian (for Pi2 support), the LXDE autostart file is located at /etc/xdg/lxsession/LXDE-pi/autostart. I’ve updated the instructions to reflect this change. The full setup - with the Pi exposed. Configuring the Pi to be a kiosk was pretty easy. The idea is to have the Pi boot to a full-screen browser that loads a predetermined page. Additionally, I installed VNC so that I could view the desktop remotely if necessary. Please Note: If the LXDE-pi folder doesn’t exist on your, you may be using an earlier version of Raspbian. The correct location for the pre-2015 Raspbian is /etc/xdg/lxsession/LXDE/autostart. The Graphite dashboard pictured at the top of this article seemed to have a memory leak because both Midori and Chrome would crash after running the dashboard for about 20 hours. Instead of trying to fix Graphite I treated the symptoms. Xdotool is one of the handy utilities written by the awesome Jordan Sissel and allows you to simulate keyboard and mouse input. That should be all you need to do to get the Pi configured. I use RealVNC to connect to the Pi. If I’ve left something out, please leave a comment and let me know.